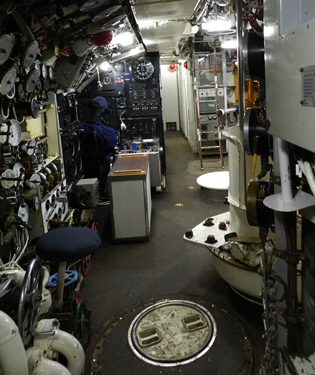 However, the galley in Ojibwa was in the Control Room space immediately forward of the Engine Room bulkhead where the diesel smell was strongest, and almost directly across the passage way from the heads. Not far for it to go we use to say. Meals were picked up and carried through the control room to the wardroom, senior rates mess, and junior rates mess and were carried aft through the engine room and motor room to the after end junior rates mess. That meal transport could be a serious challenge in rough weather on the surface. Getting by the conning tower hatch with gale force wet wind supplying the donks without losing your steak, eggs and chips was not easy. With early sunset in winter the control room was always in dim or black lighting. We were like blind men when transiting the control room. It was a good thing to become familiar with the lowest hanging sharp metal obstacles along the way. However, carrying a meal past the hungry control room watch keepers while concentrating on the dim spot of light shone on the deck to assist you through could result in an MT (empty) plate at the other end. We were buddies in boats but there was no mercy. In fairness, we usually ate very well in submarines. Better than in the skimmers for sure. There was the occasional chef that didn't quite cut it; but most were very good and extremely creative. The 2 or 3 chefs on board were responsible to turn out 3 full meals per day for the 65 to 70 hands on board. They provided a late "snack" (nine o'clockers") only later, for the middle watchmen going on at midnight. One chef usually worked through the night to prepare veg and other food stuff to be cooked the next day. The "night chef" was also the baker and turned out deserts and bread. Along with their galley duties they worked many other secondary duties throughout the submarine and always responded to emergencies and action stations. Never mind the task of preparing great hot meals in very rough weather on the roof. 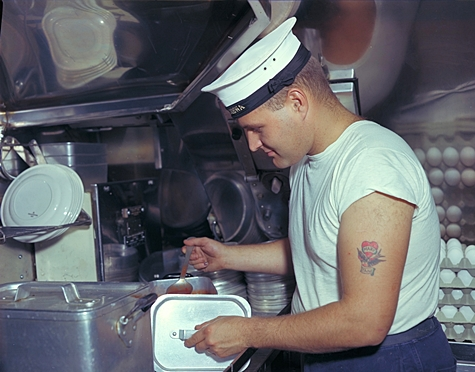 That was arms and legs in emergency for the chef who was trying to salvage the meal and not to get scalded or burned while pots and pans were skidding all over the galley. They were challenged with things like the ER starting a snort when they were half way through raising the dough for a batch of bread. When the donks drew a vacuum the dough went flat. At breakfast we were privileged with eggs to order, but if the boat assumed an up or down angle in the middle of doing "sunny side up" he had to really 'scramble' as the eggs went long and headed for the edge of the grill. His imagination was often stretched to the limit when he was denied electrical power due to a low battery and/or the present operational situation. Sandwiches would be easy if the 'fresh bread' we brought on 5 or 6 days ago hadn't started turning green around day two. That green bread became toast, smaller by the day as hungry submariners picked off the brightest green to put what remained in the toaster. 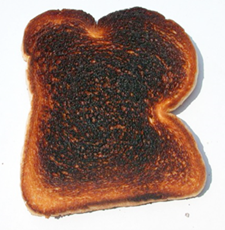 To this day I prefer my toast burnt black. The chefs had a significant role on board. In my senior time in boats I continued to praise them and remind them that, at 300 feet for weeks at a time, the crew had only three things per day to look forward to. And they all came out of the galley.